Railpictures.ca - Dave Burroughs Photo: A CP westbound is pulling out of Agincourt yard at a spot between Brimley Rd. and McCowan Rd. Note the Bangor and Aroostook leaser in the consist. This picture would have been taken late in the afternoon after I got out from the education centre at IBM. This was a good spot to watch trains arriving and leaving Agincourt Yard as well as observing the hump units pushing cars over the hump at the classification yard. | Railpictures.ca – Canadian Railway Photography – photographie ferroviaire Canadienne. Copyright Notice: This image ©Dave Burroughs all rights reserved. Caption: A CP westbound is pulling out of Agincourt yard at a spot between Brimley Rd. and McCowan Rd. Note the Bangor and Aroostook leaser in the consist. This picture would have been taken late in the afternoon after I got out from the education centre at IBM. This was a good spot to watch trains arriving and leaving Agincourt Yard as well as observing the hump units pushing cars over the hump at the classification yard. A few units like 4055, 8511 and 8900, for a time, had a shield with the script lettering, a silver outline, and a small “Spans the World” logo on it too. Thanks for the info. That explains the randomness of the beaver shields on steam genny equipped long hoods. All the CP covered wagons got the shield at the front, both passenger and freight. It was only the steam-generator equipped hood units that got a small beaver shield at the front, like certain GP9, H16-44, RS10 and Train Master groups (8900-8904). Sometime around the mid-late 60′s or so, CP started removing the front shields, and was repainting units with just the front yellow stripes or touching up where the shield was. Steve, I was always under the impression that the beaver shield was applied to passenger units which included GM, MLW and CLC A-units. There was a small beaver shield on the long hood of some of the MLW RS-10′s such as 8475 which were equipped with steam generators. 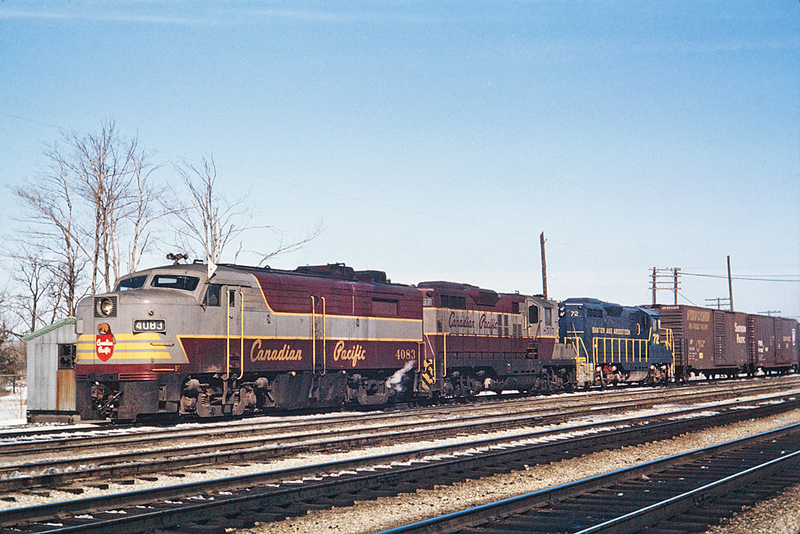 Strange though, in the Rail Canada book for diesel paint schemes of the CPR, there are pictures of CLC H-16-44 8556 and H-24-66 8900 with a beaver shield on the long hood. So was the beaver only applied to emd and alco covered wagons? Love the classic CP Liveries!